The lesser horseshoe bat (Rhinolophus hipposideros) is one of the smallest mammals in Ireland. It was first recorded in Ireland from a cave in County Clare in March 1859. It is easily identified by, and gets its Latin name from, a horseshoe-shaped flap of skin surrounding the nostrils. Adult horseshoe bats have buff brown fur while the fur of those until the first moult is grey. Unlike the other eight bat species found in Ireland, the lesser horseshoe bat is unable to crawl so must fly, swallow-like, into a roost where it then turns upside down to hang from a surface by its feet. It produces a highly distinctive echolocation call that sounds like a melodic warble when heard on a bat detector (a device that transforms ultrasonic sounds into those audible to humans), although it also produces audible squeaks. The insects eaten by this bat include craneflies, caddis flies, lacewings, midges and moths, which it catches in woodland, scrub and along treelines and hedgerows, including those associated with lakes, rivers and streams. In winter during sustained spells of cold weather this species hibernates in underground sites such as caves, mines and cellars, but moves to warm areas of mainly uninhabited buildings during the summer to rear its young. The lesser horseshoe bat is one of 71 known species of horseshoe bat found worldwide, but the only horseshoe species to occur in Ireland. Its worldwide distribution extends from Ireland, its most northerly and westerly limit, eastward through Wales, England, Portugal, Spain, central Europe, across to Poland and Ukraine, to southern parts of north and east Africa, the Middle East and onto Asia. In Ireland the lesser horseshoe bat is confined to six western counties, Mayo, Galway, Clare, Limerick, Cork and Kerry. The reason for this may be due to the fact that the west of Ireland is influenced by the Gulf Stream, so frosts are rarer and shorter in duration than in other parts of Ireland, resulting in greater availability of insects on which the bats can forage. Also, caves are widespread in these six counties, particularly in Clare and Galway, and these provide suitable hibernation sites for the bats. As already mentioned, the lesser horseshoe bat uses a range of underground structures in which to hibernate. In such sites this species hangs free, at a short distance from other bats, usually with its wings folded around its body, in a cloak-like fashion. Saving energy is a major priority for all bats in winter and they achieve this by lowering their normal body temperature of 35oC to that of the underground site; the lesser horseshoe bat prefers sites with an ambient temperature in the region of 8oC. However, at a number of the Trust’s reserves in Kerry, up to 100 lesser horseshoe bats may be found hibernating in the ground floor rooms of the summer roosts during mild winters, probably because the ambient temperature does not fall below that preferred for hibernation in this part of the country. Originally a cave-dwelling species all year round, in Ireland the lesser horseshoe bat chooses buildings for its summer or nursery roosts, although in parts of southern Europe nursery roosts are still found in caves. Research and survey work by the Trust has shown that this species prefers old stone buildings, usually with natural slate roofs, for summer roosts, because these offer a warm area, usually at the roof apex, in which to rear the young. However, this species is also found in sites that appear less suitable: ‘transition’roosts are mainly used in spring and autumn; ‘night’ roosts are used as resting places between feeding periods; while ‘satellite’roosts are those close to a major maternity roost, but containing smaller numbers of females and young. In summer some male bats use the same buildings as the females, but most roost elsewhere, singly or in small numbers in structures that can be less well insulated. Females begin to occupy the nursery or maternity roosts from April onwards, giving birth to just one pup from mid June to early July. However, not all females will reproduce each year and only a small percentage of the younger females reproduce in their first year. The pups are suckled for up to six weeks, although they start flapping their wings when they are about three weeks old, often while hanging from their mother. In the autumn, as night temperatures drop and insects become less abundant, the nursery colonies gradually disperse, either to transition roosts or directly to the hibernation sites. Mating takes place during the autumn and winter, but pregnancy does not commence until the following spring, when ovulation occurs; this reproductive strategy is called ‘delayed fertilisation’. This ensures that pregnancy and birth coincide with food abundance. Radio telemetry research undertaken by the Trust has shown that this species hunts in what are termed ‘cluttered’ habitats, such as dense vegetation in woodlands and that associated with water courses, along tree lines and well-developed hedgerows. Two characteristics contribute to this bat’s ability to do so: it has short, broad wings, generally resulting in slow but highly manoeuvrable flight, sometimes described as ‘butterfly–like’, and it has a highly sophisticated auditory system that enables it to not only safely navigate in the pitch black of caves, but to also detect the wing beats of insects. It is the only Irish bat species capable of exploiting Doppler-shifted echoes, and it emits calls at between 105kHz and 115kHz, higher than the other bats. However, one disadvantage of such high frequency calls is that they do not travel far from the bat, so this species cannot detect distant objects. As a result, it must commute between roosts and foraging habitats by closely following linear features, such as hedgerows, stone walls, earth banks and tree lines. The main prey items eaten in summer are those listed above. However, the lesser horseshoe bat also forages in mild weather throughout the winter, as shown by a recent study of droppings collected at hibernation sites in Clare. Important prey items were those insects associated with the dung of grazing cattle, such as dung flies, as well as winter representatives of small flies, such as the winter gnat. The Irish lesser horseshoe bat population is thought to be stable and possibly even increasing, with an estimated 14,000 animals believed to occur across the six counties. However, there is evidence from the 1980s and more recently that sustained spells of cold weather causes high mortality in winter, particularly amongst the juveniles, from which it takes time for the population to recover. This species is protected under the Wildlife Act (1976) and Wildlife (Amendment) Act 2000. Due to the specific requirements of this species, such as a range of old buildings in summer, underground sites in winter, dense vegetation for foraging and linear features for commuting, it is given added legislative protection under the EC Directive on the Conservation of Natural Habitats and of Wild Fauna and Flora (Habitats Directive). As a result Special Areas of Conservation (SACs) have been created for it throughout its European range, including Ireland, and these are monitored each year. In the 2011 Bat Conservation Ireland publication ‘Landscape conservation for Irish bats and species specific roosting characteristics’, the authors stated that the small region currently occupied by the lesser horseshoe bat represents the only suitable range for this species in Ireland, based on habitat association and landscape modelling. As a result, even low levels of habitat modification or changes to roost availability could have significant adverse effects on the lesser horseshoe bat in Ireland. A leaflet giving guidance to farmers on how they can help to conserve this species was published in 2012, with funding from the Heritage Council. This leaflet can be downloaded from our Resources section (select Bats) on this website. Dr Kate McAney conducted research on the summer activity of the lesser horseshoe bat in County Clare for which she obtained her PhD at University College Galway in 1987. She has worked for The Vincent Wildlife Trust in Ireland since 1991. 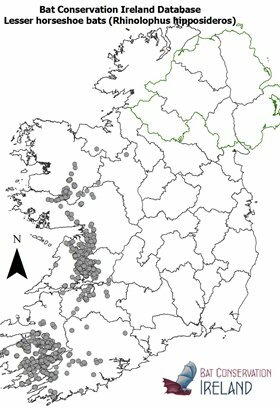 McAney, K., O’Mahony, C., Kelleher, C., Taylor, A., & Biggane, S. (2013) The lesser horseshoe bat in Ireland: a series of surveys conducted by The Vincent Wildlife Trust. The Irish Naturalists’ Journal. Belfast. McAney, K. (2010). A pilot study to test the use of hair tubes to detect the Irish stoat along hedgerows in County Galway. A report prepared for the Heritage Council. Co-author of the lesser horseshoe bat species account: Mammals of the British Isles: Handbook, 4th edition (2008). Editors: S. Harris, S & Yalden, D.W. The Mammal Society. Southampton. McAney, C.M. (2006) A conservation plan for Irish vesper bats. Irish Wildlife Manuals, No. 20. National Parks and Wildlife Service, Dublin. McAney, K. (2005). The Leisler’s bat (Nyctalus leisleri) in the Republic of Ireland – a review.Nyctalus. 10: 315-316. McAney, C. & Fairley, J.S. (1990). Activity of Leisler’s bat Nyctalus leisleri (Kuhl, 1817) at a summer roost in Ireland. Myotis 28: 83-91. Shiel, C., McAney, K., Sullivan, C., & Fairley, J. (1989). Identification of Arthropod fragments in bat droppings. An occasional publication of The Mammal Society. No. 17. Identifying feature:Horseshoe nose leaf, long legs, hangs with wings wrapped around body. Number of young:1 pup, born mid June to early July. Diet:Small insects including midges, moths, craneflies, lacewings. Habitat:Summer roosts in old, generally uninhabited buildings; winter roosts in caves, cellars and mines; forages in deciduous woodland and in riparian vegetation.